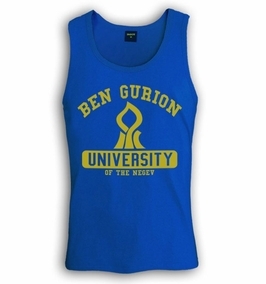 Welcome to Ben Gurion University! This great Israeli university situated in Beer-Sheva was founded in 1969 and gained its current name in 1974. Ben Gurion was Israel's first prime minister and in accordance with his vision of settling the Negev desert, in which the university is located, the university's motto goes: "the research and scientific prowess of the Israeli people will be tested in the Negev". Show some Ben Gurion spirit and proudly wear these high quality Ben Gurion University T-shirts sporting the Ben Gurion logo. Our t-shirts are made of 100% cotton and are long lasting with bright colors. Our products are all designed and printed in Israel.